Let's the holiday season begin! I'm up on the Sunny Studios blog today with the Playful Polar Bears stamp set. 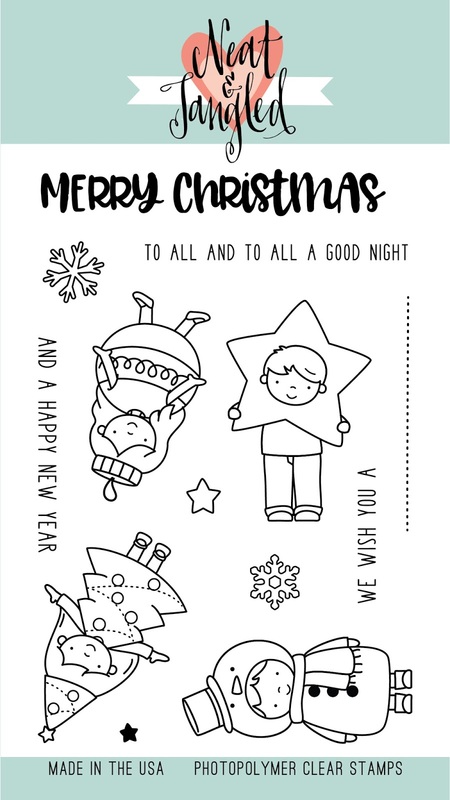 While it's not a traditional Christmas stamp set, I think the wintery feel and polar goodness of it reminds me of the season. Last week I created a very traditional holiday card, so let's try another twist and go in a completely different and colorful direction! Hop on over to the Sunny Studios blog for more details and how-to's! Hey there, welcome to the day two of the November Neat and Tangled release. The last stamp set up is called Bunny Slope and it's full of good, wintery fun. I love this one for coloring! The new Stitched Slopes steel die is also a favorite. To create this card I started with the Stitched Slopes steel die and shades of blue cardstock. Layering them over the background with an ombre effect gives the card a cool feel and is the perfect backdrop for the bunny. The stamped images from Bunny Slope were watercolored with Peerless Watercolors and tucked in between the layers of cardstock. A few sequins lead the eye right up to that sentiment stamped in black. 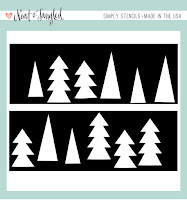 Neat and Tangled will be giving away a Bunny Slope stamp set. To enter, leave a comment below to be entered. Visit the Neat and Tangled blog on Friday for a list of winners. Good luck and thanks for stopping by! Hey there, welcome to the day three of the November Neat and Tangled release. The next stamp set up is called Joyful Sentiments and it's full of beautiful script font sentiments. 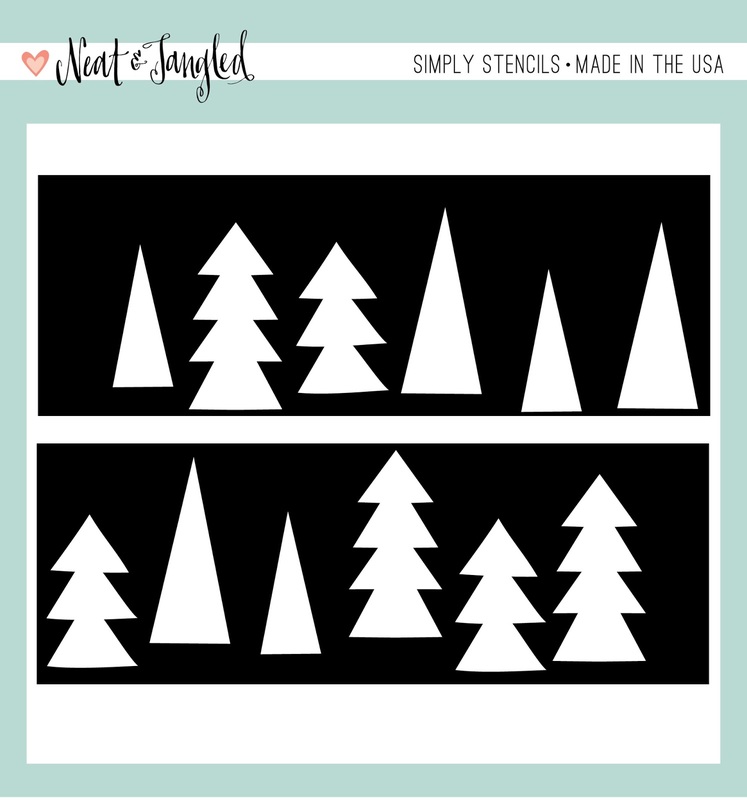 I love the variety and they make a perfect compliment to the new Radiating Star Stencil. To create this card I started with a plain white base so that the stenciled image would really show up. A little ink blending starting with a vibrant blue, gradient purple and magenta give the card a beautiful wash of color. 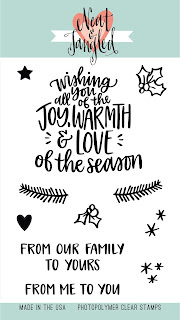 The Joyful Sentiment stamped was used to add some words in black ink. A final sprinkle of purple sequins finishes off the card. 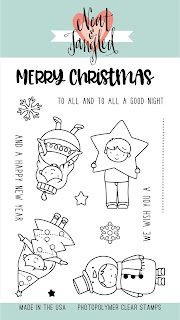 Neat and Tangled will be giving away a Joyful Sentiments stamp set. To enter, leave a comment below to be entered. Visit the Neat and Tangled blog on Friday for a list of winners. Good luck and thanks for stopping by! 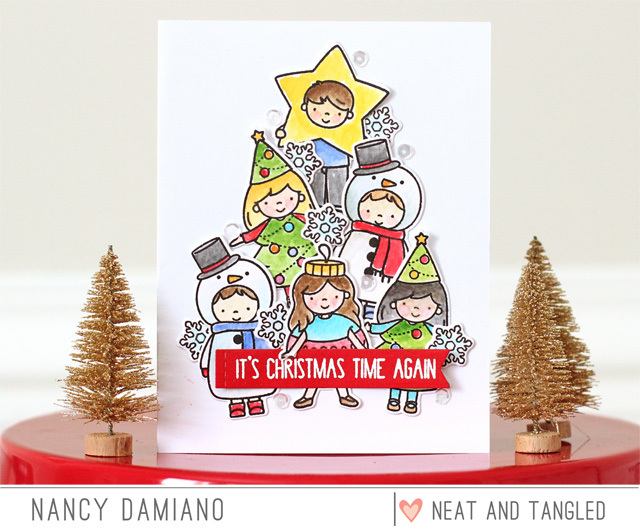 Neat and Tangled November Release | It's a Christmas Pageant! Hey there, welcome to the day two of the November Neat and Tangled release. 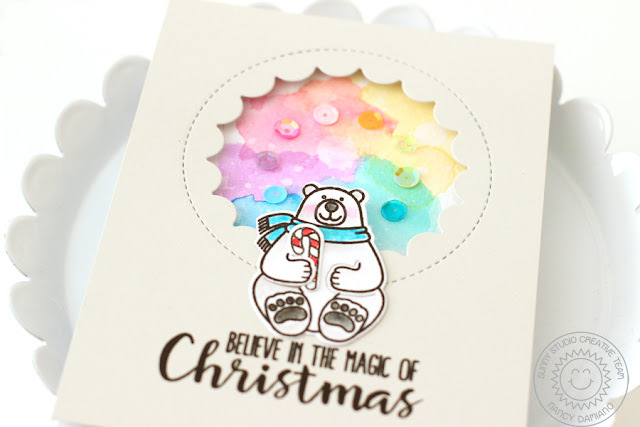 The next stamp set up is called Christmas Pageant and it's my absolute favorite of this month's release. Kids in costumes get me every time. I love to color images like these - it makes me happy! To create this card I started with a plain white base so that my stamped images could really shine. 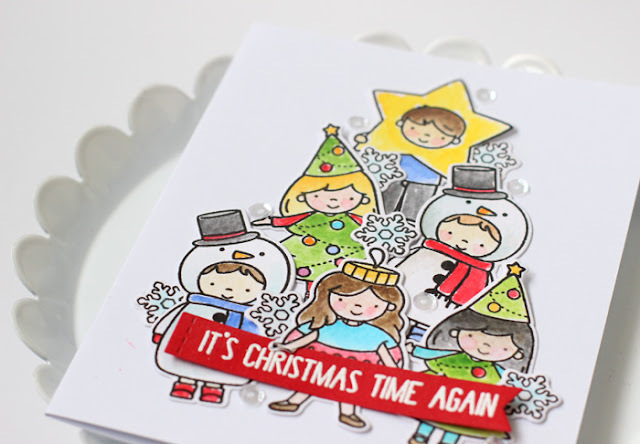 Each of the little people were watercolored using Distress Inks and cut out using the Christmas Pageant Steel Die. Next, I stacked them in the shape of a Christmas tree with the star on top. The sentiment was embossed in white on red cardstock and placed at the bottom of the card to ground the design. A sprinkle of stamped snowflakes cover the blank spots and give it a wintery feel. Neat and Tangled will be giving away a Christmas Pageant stamp set. To enter, leave a comment below to be entered. Tell me if which of the Christmas Pageant kids is your favorite to enter. Visit the Neat and Tangled blog on Friday for a list of winners. Good luck and thanks for stopping by! Neat and Tangled November Release | Wishing You Love! Hey there, welcome to the first day of the November Neat and Tangled release. The first stamp set up is called Wishing you Love and it's all about Christmas and sentiments. I love all of the different \ possibilities included in this set. Icons and scripty text make it a perfect set for the holidays! To create this card I used an ink blending technique and the new Tree Duo Stencils to create a colorful border at the bottom of the card. The Wishing You Love sentiment was embossed in red for a bold splash of color. A few sequins from the Snowfall Mix were sprinkled across the front of the design. 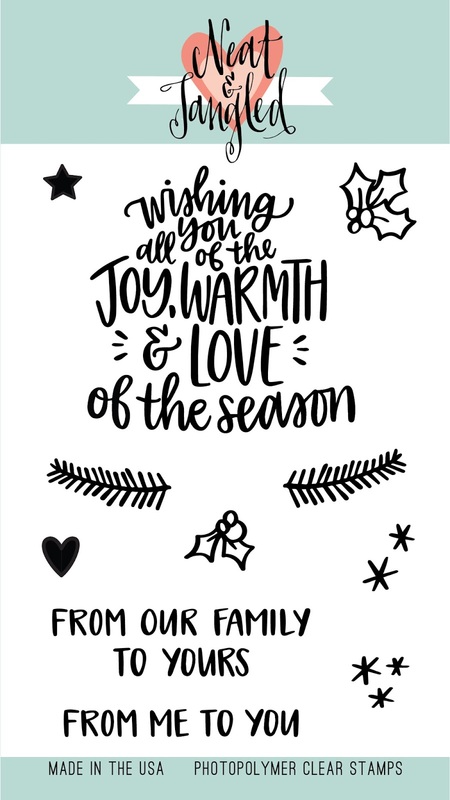 This is a quick and simple card full of handmade goodness! Neat and Tangled will be giving away a Wishing You Love stamp set. To enter, leave a comment below to be entered. Tell me if you prefer a real or fake tree (it's a great debate!) to enter. I'm curious to see how we tally up. Visit the Neat and Tangled blog on Friday for a list of winners. Good luck and thanks for stopping by!